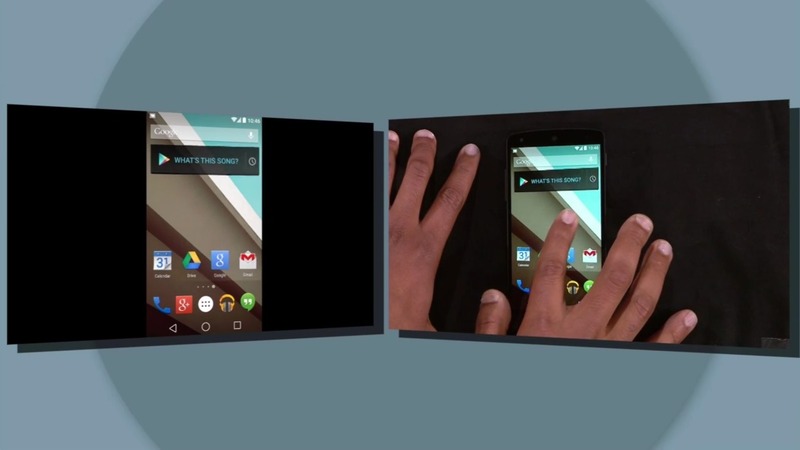 Chromecast might not be the most dramatic of Google's products on stage at I/O 2014, but it's getting just as much love. Rishi Chandra, product manager for Chromecast, demonstrated a lot of new features in his presentation. The low-cost streaming device will get newer and more advanced capabilities soon, including the ability to stream the screen contents of your phone or tablet directly to the television. We've seen this done with various third-party hacks, not to mention a peek or two on some people's active devices. The demonstration during the keynote was impressive: after casting the phone screen to the television, the video was smooth and effective, though you could see a tiny bit of lag. In portrait mode it was shown with large black areas to either side, but a quick rotation to full-screen landscape mode was seamless. Chandra showed off the mobile version of Google Earth (with some taxing 3D animation) as well as the phone's camera being mirrored on the screen. Hopefully this means that the wireless latency will be low enough to allow for Android games to be played while mirroring. Unfortunately, this probably won't be a universal experience. 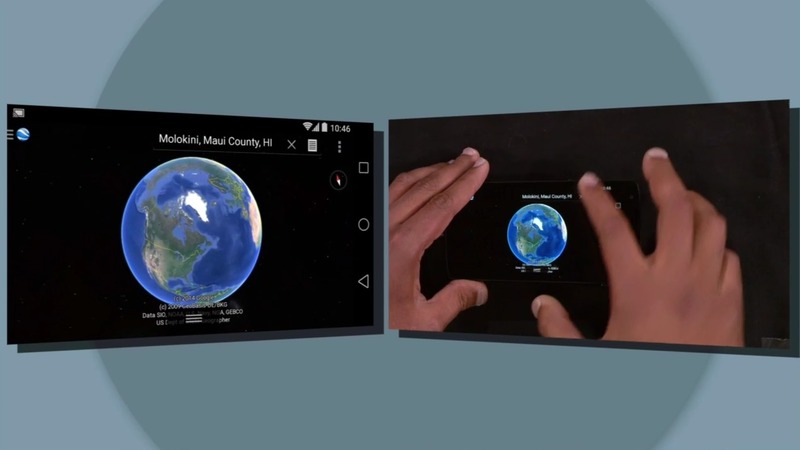 The Google demonstrator said that mirroring would be released in beta via a Google Play Services update in the next few weeks, and that devices from "HTC, Samsung, and LG, and Nexus" would be compatible. That would seem to imply that not all phones and tablets will be compatible. Chromecast will soon allow you to cast from phones and tablets that aren't on the same WiFi network as the Chromecast hardware itself. Chandra demonstrated a phone on a standard LTE network casting to a friend's television based solely on proximity, presumably determined by either 3G or Wifi location. He also said that PIN security and verification could be displayed on the screen. 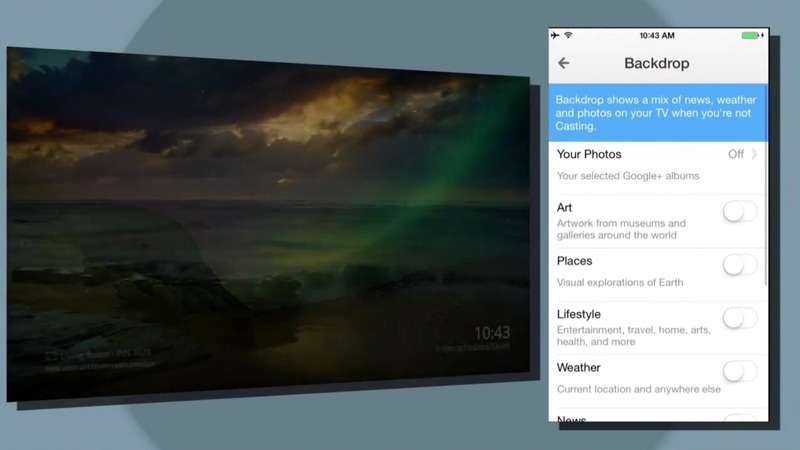 Lastly, the photos displayed when Chromecast is not actively streaming are going to get a substantial update. The Chromecast app for Android will soon allow you to choose between categories of photos, as well as allowing you to display photos from one or more of your personal Google+ galleries. (Sorry, it looks like there's no option for local storage - a full-time connection is required.) 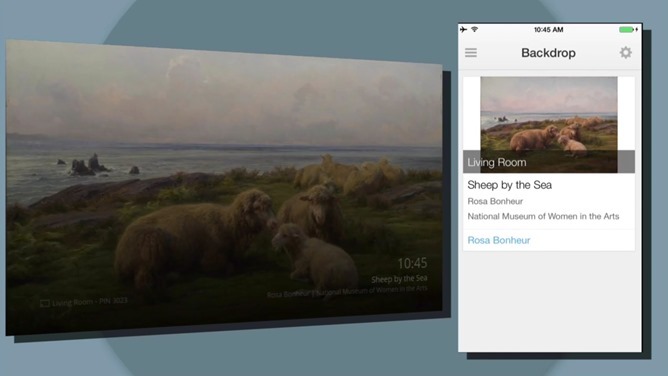 You can also see interesting information about the current photo, such as a satellite image or a famous painting, with the Google Now command "what's on my Chromecast." Keep in mind, running this photo mode 24/7, as recommended during the presentation, will almost certainly be incredibly expensive from an electricity standpoint. Expect these changes to hit the Chromecast app and Google Play Services, in addition to an over-the-air update for Chromecast itself, in the next few weeks. Some features may still be in beta.